Grounders, gopher balls, and dingers. Tales from a casual baseball fan. I know what you’re thinking. “How can Mark McGwire be ranked higher than Tony Gwynn or Rod Carew?” I know it seems ridiculous. I mean, the guy was an admitted steroid user. It’s not like he was prolific at anything other than hitting homeruns. But that’s just it. He was the most prolific homerun hitter ever. Sure, there were guys who hit more homeruns throughout their career, but nobody did it at the rate McGwire did. 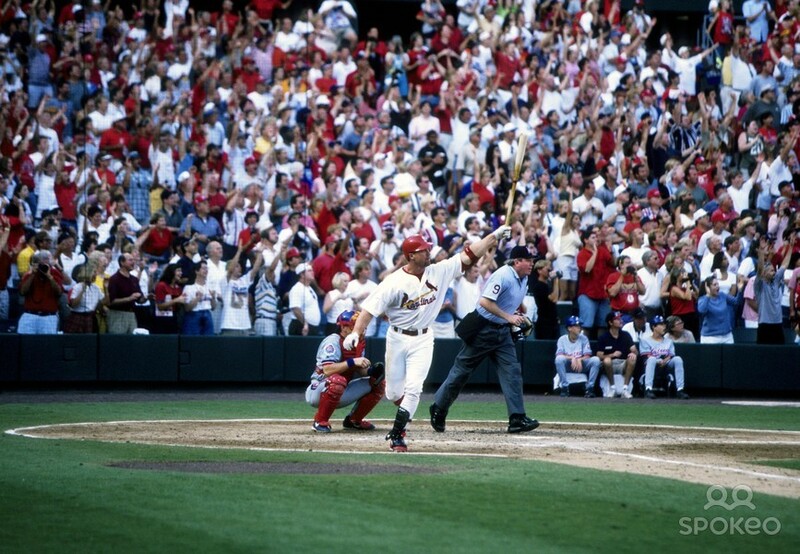 McGwire hit a homerun every 10.6 at-bats throughout his career. Babe Ruth is next on the list with a homerun every 11.76 at-bats. That’s a full at-bat more for each homerun. To put this into perspective each player averaged roughly 540 at-bats per 162 games, therefore McGwire would have finished an average 162 game season with 51 homeruns, whereas Ruth would have finished with 46 homeruns. The discrepancy becomes even greater when you extrapolate the numbers out over a larger period of time. For example, if Mcgwire would have had the same number of career at-bats as Babe Ruth (8,399) he would have finished his career with 792 homeruns, which would obliterate not only Ruth’s career homerun total, but Aaron’s and Bonds’ as well. This isn’t to say that McGwire would have been this productive had he never taken steroids. Again, my rankings are based solely on performance. McGwire’s performance tells us that he is the most prolific homerun hitter ever, even more so than the biggest superstar in the history of the game. There are so many other remarkable stats surrounding McGwire and his ability to absolutely demolish that little white ball and send it over the fences every two and a half games. While Gwynn and Carew were revolutionary hitters, they weren’t historical on the level that McGwire was. Sure, McGwire isn’t the perfect example of a great baseball player, but what he did well he did better than anyone else in the history of the game. There is a prototype for every position. A first baseman is expected to be a towering, brutish, mammoth of a man who mashes the ball from one foul pole to the other, and everywhere in between. His fielding ability isn’t as important as his ability to smash the ball with the power of an ox. A center fielder is expected to be the best athlete on the team. Possessing the speed and grace of a gazelle, with an arm as accurate and ranging as a sniper rifle, and the ability to hit to all fields with power. He should be able to range from left to right and track down every ball hit in play. But before Eddie Mathews third base didn’t have an identity. Third base was where teams hid their punch and judy hitters. Sure, some of them could field the ball with swift and artful skill, but for the most part third baseman were the ninth best player on the field. That is, until Eddie Mathews burst onto the scene. And burst he did. Eddie’s career began in 1952 with the Boston Braves. He hit 25 homeruns during his rookie season, which broke the rookie record at the time. Following his rookie season Mathew’s went on to hit 30 homeruns in nine straight seasons from 1953 to 1961, winning the National League homerun title in 1953 and 1959. His 47 homeruns in 1953 set a single-season record for third baseman that lasted 27 years. Mathews played 15 years for the Braves organization before being traded to Houston. He was the only player to have player for the Braves in Boston, Milwaukee, and Atlanta. He was elected to 9 All-Star teams during his tenure with the Braves organization. He led the league in walks four times, and was a member of two world championship teams. Thanks to Eddie Mathews third base is no longer where the weakest position players go to hide. Third base is now a prime position where smooth fielders are also great hitters. Eddie Mathews broke the mold and paved the way for Mike Schmidt, George Brett, Adrian Beltre, and David Wright to prove that third base is a power position not only in the field, but also in the lineup. Robin Roberts was a relentless power pitcher for 14 years with the Philadelphia Phillies until overuse and injuries took their toll. He then reinvented himself for the final five years of his 19 year career into a finesse pitcher with pinpoint accuracy. Roberts was not only relentless, but he was a true workhorse. He pitched over 300 innings in six straight seasons. He never gave up more than 77 walks in those six seasons. From 1950 to 1955, a stretch of six consecutive seasons, Roberts won at least 20 games, with league highs in wins for four straight seasons, beginning in 1952 when he went 28-7. Roberts pitched an era when relief pitchers were regularly employed, yet he led the NL in games started six times, and five times in complete games and innings pitched. He even pitched 28 straight complete games. 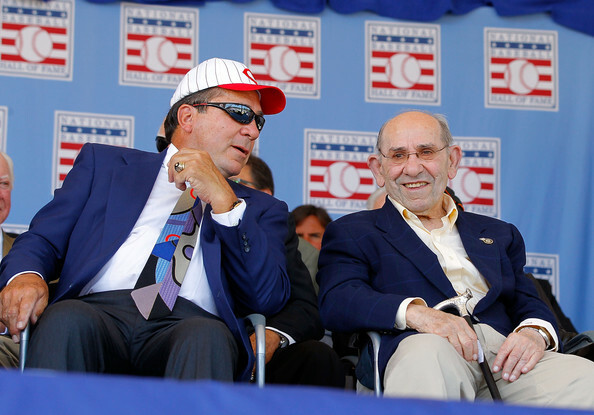 Yogi Berra and Johnny Bench are arguably the two greatest catchers in the history of the sport. Bench caught for arguably the greatest team ever assembled in the “Big Red Machine” Cincinnati Reds teams from 1970 to 1976. Berra appeared in 21 World Series as a player, coach, or manager during his illustrious career, which is a truly remarkable feat. They were both extraordinary with the glove also. In 1958 Yogi caught the entire season without committing an error. Bench was Rookie of the Year in 1968, and during that same season he won his first of 10 consecutive Gold Gloves and was elected to the first of 14 consecutive All-Star games. Berra hit 20-plus homeruns in a season an astonishing eleven times, and won three MVP Awards. Bench hit 40 homers in a season twice, which is very rare for a catcher in any era. Bench also led the league in RBI’s three times, and won the MVP twice. The one amazing thing about Yogi Berra that I don’t think many people recognize is how many iconic highlights he was a part of. When Jackie Robinson stole home in the 1955 World Series, Yogi Berra was there. When Don Larsen pitched a perfect game in the 1956 World Series Yogi Berra is the excitable man who jumps into his arms after the final out is recorded. 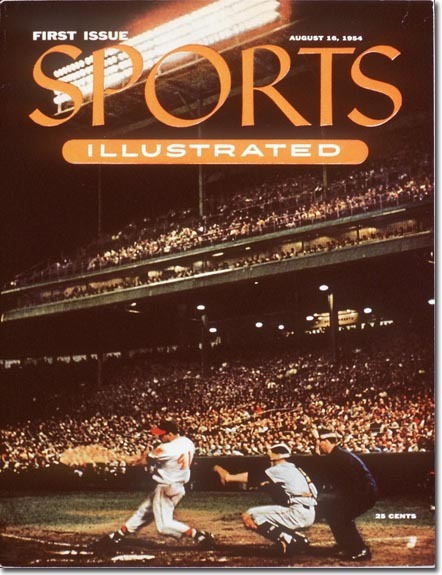 When Bill Mazeroski hit the World Series winning homerun in the 1960 World Series, Yogi Berra was there too. The two men whom most consider to the be best to ever to play their position had remarkably similar careers. So similar, in fact, that I couldn’t choose one over the other. Therefore we have a tie at number 87. A 3.33 career ERA, 213 wins, and 3,084 strikeouts certainly are Hall of Fame-caliber numbers for a starting pitcher, but they don’t jump out at you as dominant numbers. John Smoltz did suffer from a significant injury in the middle of his career causing him to lose the entire 2000 season and subsequently shift to the bullpen, where he maintained his dominance but possibly lost 50 wins from his career win total. In the three and half years Smoltz served as the closer for the Atlanta Braves he saved 154 games. Then, when his injuries healed and he was ready to rejoin the rotation in 2005 he went 14-7, 16-9 (leading the Majors in wins), and 14-8 over the next three seasons respectively. His career Wins Above Average of 38 is barely one win shy of teammate and 2014 Hall of Fame inductee Tom Glavine’s 39.1 WAA. Smoltz was certainly one of the most dominant pitchers of his era. Ty Cobb wasn’t known for having friends, but for reasons unknown to many, Cobb befriended Harry Heilmann in 1921 when Cobb took over as manager of the Tigers, and began to mentor the hitter until Heilmann became a true Cobb disciple. That season, 1921, Heilmann won the first of his four batting titles with a batting average of .394. He would alternate winning titles every other year winning in 1923 with a .403 average*; 1925 with a .393 average; and 1927 with a .398 average. He also had over 200 hits in each the four years he won the batting title. *Harry Heilmann was the last right-handed batter to hit over .400, and one of the last two American League players to hit over .400 (Ted Williams, .406). Heilmann’s On Base Plus Slugging Percentage of .930 ranks ahead of Hank Aaron, Tris Speaker, and Frank Robinson, among others. Heilmann was also the first player to hit at least one homerun in every Major League park in use during his career. Tim Raines has been on the Hall of Fame ballot for seven years now. The highest percentage of votes that he has acquired is 52.2% in 2013. This is still almost 25% short of the votes needed to be elected into the Hall of Fame. The only reason that I can figure for Raines’ exclusion from the Hall of Fame is Rickey Henderson. Rickey was so much better than everyone else in the history of the game at what he did that even the second and third best look like they are just ok. If it wasn’t for Rickey Henderson Tim Raines would be in the Hall of Fame already. Lou Brock is in the Hall of Fame. He was elected on his first attempt. Brock and Raines were similar in many ways. Brock’s career batting average was .293 while Raines’ was .294. Brock did accumulate more hits in his career, but he also had nearly 1,000 more plate appearances than Raines. But Raines was efficient. He totaled 1,330 base on balls with a .385 On Base Percentage versus Brock’s 761 walks and .345 On Base Percentage. While Brock was able to swipe 938 bases in his career, good for second most behind Rickey Henderson, Raines swiped 808, good for fifth all time. However, Raines was far more efficient on the base paths. His 84.7% Stolen Base percentage far outshines Brock’s 75.34%. Even though Brock had more career hits than Raines, he reached base fewer times (3,833) than Raines (3,977). Raines also had more homeruns (170) than Brock (149), and more RBIs (980 vs. 900). Tim Raines wasn’t as good as Rickey Henderson, and it was unfortunate for Raines that their careers overlapped. But, Raines was more efficient than Hall of Famer Lou Brock. 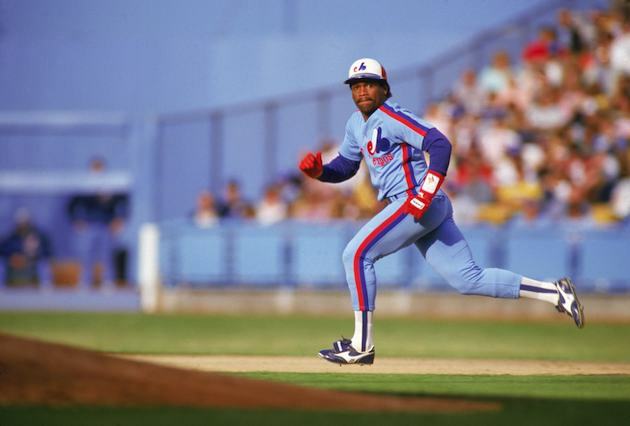 His career WAR of 69.1 suggests that Tim Raines was a better player than Lou Brock and his 45.2 WAR. I believe that Tim Raines deserves to be in the Hall of Fame, and he deserves to be ranked at number 84 on my list of top 100 greatest MLB players of all time. Craig Biggio was the 27th member of the 3,000 hit club, but only the ninth (at the time of his 3,000th hit) to get all 3,000 hits with only one team. Biggio stroked his 3,000th hit on June 28, 2007 and became the first player in history to collect five hits in the same game in which he collected his 3,000th hit. One Biggio stat that I always found remarkable was that he never grounded into a double play during the 1997 season. Not once. I mean, that is almost unfathomable. Either he came to bat with nobody on first base at an incredibly rare rate, or his combination of hitting ability and speed allowed him to avoid grounding into a double play at any time during that season. Sure, luck may have played some part in it, but I believe his skill trumped his luck. The following season, 1998, Biggio joined Hall of Famer Tris Speaker as the second player in Major League history to collect 50 doubles and 50 stolen bases in the same season. Biggio was in scoring position in the 1998 season at least 100 times. Surprisingly enough, he only score 123 runs during the 1998 season, 23 fewer than he did in his league-leading 1997 season. Even more shocking is that he was tied for sixth in the Major’s in runs scored, and finished one behind teammate and fellow “Killer B” Jeff Bagwell in that department. Biggio finished his career after the 2007 season with a .281 career batting average, 1,844 runs scored, 668 doubles, 1,160 walks, seven trips to the All-Star game, and three Gold Gloves. Dave Winfield was the prototypical five-tool player. His massive 6-foot-6 frame was built into the perfect blend of durability, strength, raw power, and consistency. Possessing that kind of natural talent was the reason why Dave Winfield was, and still is, the only person in history to be drafted by four teams in three professional sports out of college: the San Diego Padres (MLB), Atlanta Hawks (NBA), Utah Stars (ABA), and Minnesota Vikings (NFL). Ultimately, Winfield chose baseball. He is one of the very few players since the Minor Leagues were established that can say that he never spent one single day in the Minor Leagues. Dave Winfield played 22 seasons in the Major Leagues, earning 12 All-Star game selections. He played for six teams amassing 465 homeruns, 3,110 hits, with a .283 career batting average. He was a seven-time Gold Glove winner and World Champion with the Toronto Blue Jays. They call him “Captain Clutch” for his ability to consistently come up with the big hit in the most pressure packed situation. They call him “Mr. November” for coming up with those clutch hits late in the World Series to help the Yankees win five titles during his tenure as the Yankees shortstop. Derek Jeter is one of the most loved and respected players of his generation, and rightfully so. He has always played the game the way it was meant to be played. He runs out every ground ball, occasionally forcing an error on the defense due to his hustle. Perhaps his most memorable play was when he went face first into the stands during a playoff game to come up with nothing but the ball in his glove and a bloody nose to prove that he was willing to go all out to help the team win. Jeter’s list of accomplishments is impressive. There are so many Yankee greats, but only one that reached 3,000 hits playing for the Yankees. No, not Lou Gehrig. Not Mickey Mantle either. Nope, Joe DiMaggio didn’t get to 3,000. Derek Sanderson Jeter is the only Yankee player to reach 3,000 hits. And in true Derek Jeter fashion his 3,000th hit was a homerun. Jeter is the only player in Major League history to go 5-for-5 on the day he hit his 3,000th hit. Craig Biggio went 5-for-6 on his big day. Jeter passed Rickey Henderson as the all-time Yankees stolen base leader when he swiped his 327th base in 2011. Jeter is one of only three players with more than 3,000 hits, 1,700 runs scored, 1,100 RBI, 300 stolen bases, and a .300 or better career batting average. The other two? Hall of Famers Willie Mays and Paul Molitor.